After many years of searching, I have found photos of the interior of club disney. 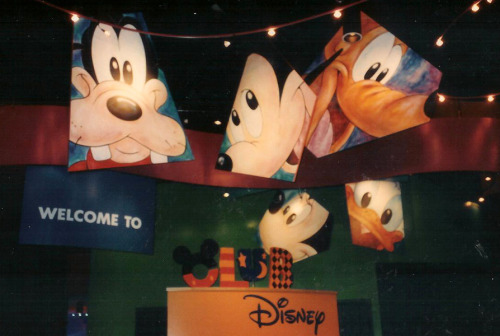 Club disney was an ill-fated Eisner project that was a group of indoor kids playzones. Club disney is so ill-fated that less people know about it's existence then for disneyquest. Club disney failed due to high admission fees, at the time it was $8 for both child and adult, one can imagine how much that is with inflation. The other reasons for closure include not a lot for adults to do, failing net profit returns, and a change of strategy at the corporate level. Club disney had many themed playzones, sadly, only photos of a few of these playzones I was able to find, but any photos are better then no photos. The logo for club disney. The one that opened in February 1997 was the very first one, which was located in Thousand Oaks California. These photos are from the opening day of one of the locations. I am assuming that this is the check in desk for club disney. "In the cafe area, Mickey and Minnie images decorate the walls of a room with blond wood tables, chairs, and floors. Dinkel once again worked to avoid an institutional feel in the lighting by using ribbon tracks with 250W MR-16s for extra sparkle. "The room is kept to 35fc," she says, pointing out that some of the MR-16s are on flexible stems to aim at the murals. The MR-16 ribbon motif reappears in the gift shop, where large cut-outs of the sun, moon, and stars are arranged like constellations on the ceiling. Track lighting highlights the walls and window displays." These photos are of the circus area. "A circus area, intended for kids from four to six years old, has a mini-carousel accented with low-voltage rim lights. Strings of lightbulbs covered with Lumisphere plastic globes in pink, purple, yellow, and blue create the illusion of a bigtop. On an upper level is a low-ceiling area meant for kids to climb around, so for safety Dinkel built fiber-optic lighting from Fiberstars into the scenic elements. "This way no one can hit their head on the instruments, and there is nothing that can get too hot," she says." The green square with the nature print on it may be the winnie the pooh area or tarzan area. "On a recent afternoon, the "Tarzan" activity center from Disney's current animated feature was the most popular place in the club, with children lined up to swing on a "vine" like Tarzan and play the jungle drums." This area seems to be the hub area, where kids await instructions for the next activity. One of the activities when club disney opened was a winnie-the pooh exercise area. "That's why it has designed a number of separate admission programs to lure visitors to the club on weekdays: educational field trips for school groups; themed birthday parties with invitations, entertainers and cake included; and multi-session workshops like Poohrobics, a 10-week parent and child stretching and exercise program led by the beloved, befuddled honey bear." It seems like later on this activity was replaced by a more fitting hurcules themed exercise area. One of the activities, as seen above was throwing thunderbolts into a pot. Some activities not shown are the computers, the special birthday rooms, some of the rotating activities like poohrobics and tarzan, and the dress up show. 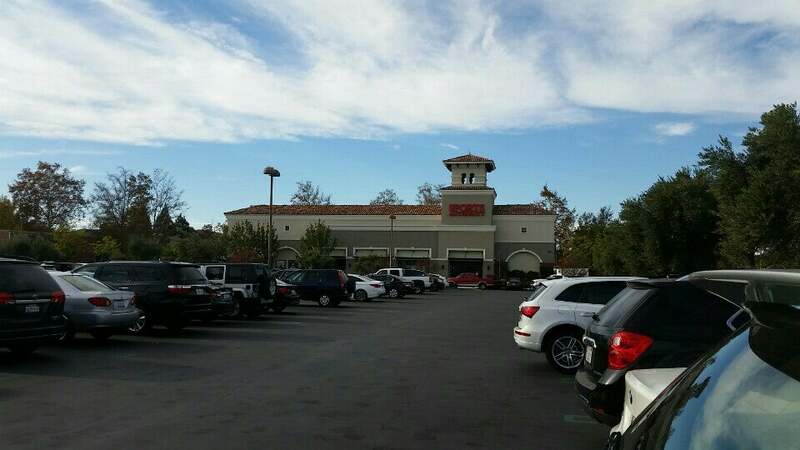 The club disney in Thousand Oaks became a sports authority. I have no clue what it is after sports authority closed. Edit: it seems to be a nike or a bed, bath and beyond now. If anyone who has been to the Pomanade and would like to share what the location is now, feel free to do so. If anyone has any stories to share about these unique locations, feel free to do that as well. Interesting! I remember seeing that logo before but don't remember these at all! I had to sign up, just to add to this thread. Was just searching for some photos myself when I stumbled upon this. I worked at the Thousand Oaks location from Oct 98 until we closed on Oct 31, 1999. Somewhere I have some photos I took a few weeks before we closed. If I come across them, I'll scan and add them to the thread. They're not great since we only had those disposable cameras back then, but like you said, any photos are better than no photos. I think I have a layout map somewhere too. In the meantime, if you have any questions, I might be able to answer them. I added some comments/clarifications to your original post in green below. You are correct. You would check in, they would put the kids shoes in a cubbie to the left by the exit, and you would enter to the right. Both sides were gated off. There was a cast member to greet you at the entry gate and to make sure everyone had a wristband. When you were ready to exit, a cast member behind the desk would get your shoes for you (I'm assuming check wristbands as well) and electronically open the exit gate. If I remember correctly, this was taken from the flex space area. They would change out the activities and theme based on the latest movie released. I remember it being Mulan, A Bugs Life, and Tarzan. I don't recall the activities for Mulan, but for A Bug's Life they had Dot's Bounce House and for Tarzan they had the Tarzan Swing, which was a zip line. Below the flex space was the Herc's Gym you have in another photo below. Although, when I was there, that space was a maze. 101 Dalmations, I think. Looking out that window you can see the top of the Applaudville Theater to the left, the Jungle Climber straight ahead with the Team Time arcade area below, and the green area to the right of that was the Winnie the Pooh area. These photos are of the circus area. The photo above is taken from the Jungle Climber, over looking the Applaudville Theater. "On a recent afternoon, the "Tarzan" activity center from Disney's current animated feature was the most popular place in the club, with children lined up to swing on a "vine" like Tarzan and play the jungle drums." This was in the flex space I mentioned above. That's the entrance to the Applaudville Theater in the background. The kids in blue are waiting to get into the MousePad computer lab. The MousePad was built in the lower level of a Scorcerer's hat. The top level of the hat had a space for parents to relax with couches and magazines to read. On the other side of that small green wall was where the big slide came out. There was always a cast member stationed at the top and the bottom of the slide to insure only 1 child went at a time. If you look past the blue pole, you can almost see the toddler area, which was themed after Casey Jr. There was a circus train they could crawl through then slide out of and a circus ring with vinyl covered foam blocks. Some activities not shown are the computers, the special birthday rooms, some of the rotating activities like poohrobics and tarzan, and the dress up show. Also not pictured, there was a large craft room located behind the Applaudeville Theater. Wow, this is a lot of great info! If you find anything feel free to post it here! Hello! Thrilled to see this post. I grew up in Westlake Village which borders Thousand Oaks and went to Club Disney a ton. With friends, birthday parties, etc. In fact, my friends are in the second photo you posted from opening day. I have been trying to do research for years but it’s been really hard to find. I do not have any personal photos but will ask around as well to try and dig up a few. Club Disney was an amazing place. I remember it vividly and would be happy to try and answer any questions anyone may have as well. The location where Club Disney sat is now a Nike Factory Store. Nice! Glad to bring some stuff to you! Any features you remember about it? Such as activities, play ares, food? Im going to say all of this based off of visual memory. C.Diz could probably fill in more and fact check me but I’ll try. Once you entered the building before you went through the turnstiles with your wristband, you had to remove your shoes and place them in a wall of cubbies. Upon entering the entire floor (counterclockwise), to the right was a Hundred Acre Wood children’s play area. Rabbit’s garden, slides, etc. Material of everything was similar to what you would see in a play area at a mall. That soft plastic with foam underneath. Moving beyond that to the right side/back corner of the building was the arcade. Here they had Mighty Ducks air hockey, Flubber skee-ball, and a Winnie the Pooh game where ping pong balls looking like bees would fly with a burst of air and you had to catch them in a plastic net you controlled. All the games would start with the press of a button. No coins or anything needed. Above the arcade was a huge jungle gym about two stories high. Tons of tunnels and platforms to crawl through. At the top was a slide that would take you all the way to the bottom. A Cast Member would sit at the top and you had to tell them what character you were and this was their way of telling the CM below you were ready to come down. In the middle/back of the building was a reflective mirror you could look into and every few minutes a face would appear (can’t recall what the face was). This effect was similar to the reflective mirror of Madame Leota in Memento Mori at Magic Kingdom. The back left corner of the building had a square room anyone could walk into. You would place your body or a funny pose on the green walls and every 30 seconds or so, there would be a big flash in the room and your body image would appear on the wall as a shadow as you stepped away to look. On the left side of the building there was an arts and crafts room. You could color, make art with paper, etc. I can’t remember what else you were able to do. Continuing to the left moving counterclockwise, moving back towards the entrance/exit, was a 101 Dalmatians maze. It wasn’t long but there were cutouts of the Dalmatians running and I believe you were trying to escape from Cruella Deville through the “streets of London”. Upon exiting the maze, there were ropes hanging from the second floor to the first floor where you could jump up and pull down which would create a deep ringing of the bells. (Not sure if the was a reference to Hunchback or not). On the second floor like I mentioned was an adult lounge which I never went to and birthday party rooms. I went to one birthday party. The rooms were long in length but not very wide. Everyone had pizza and soda. The one thing I remember from the birthday party was that after we ate, we went into a room down the hall from the party rooms that looked like a library. Inside, a Merlin face character would walk out and wish the birthday girl or boy a happy birthday and used his crystal ball which showed Mickey (seemed like a small screen inside the ball) wishing a happy birthday as well. Right before Club Disney closed, they created a room themed after Tarzan. In this room they had what seemed like swinging platforms you would see in a park as if you were swinging through trees on vines. They also had a small zip line, lined with padding underneath and at the end when you would let go of the handle. Last but not least, there was a Disney store on the left of the building as a whole that was connected to the entrance of Club Disney which was on the right side of the building. Sorry if this was all over the place but I was typing this out as it was coming to me! Dang! That sounds like it would have been amazing. Such a shame it didn't last so long. A lot of this information I have never heard of before. Not even defunctland could get this stuff. Like the arcade, I never knew there was one there. I know right!? It was a neat place. Yeah the arcade was one of my favorite sections in Club Disney. I spoke with some buddies and remembered that inside the reflective mirror was The Evil Queen fwiw. That sounds like one way to cause some nightmares lol. I live in Phoenix AZ and just put two & two together! There is a place called makutu’s island that is definitely the “planned chandler AZ club disney” location mentioned in the club Disney Wikipedia page! Still in tact!! When I took our kiddos there I mentioned that it reminded me of the Disney place I had gone to in Glendale as a kid, and my husband had no idea what I was talking out! Turns out this is why it seemed so similar! The article below confirms and explains the transition. The bottom link is for makutus where you can see tons of photos! Yep, never mentioned it here. It's cool to have a location still around that serves it's original purpose. New photo! This is the arcade area! Very exciting! I'm pretty sure I have old photos somewhere from my 1997 birthday party at Club Disney (Thousand Oaks). For now, all I could find was one of the extra invitations that came with the party package. Each invitation came with the invite information card, a puzzle that corresponded with the party theme, and a vellum envelope with the Club Disney logo. Wow, that's really nice! I never heard of the different things the information came with, so that's really neat! I'm in the phoenix area! I was trying to look at the location of the old Glendale Club Disney. It's at a corner that has a nordstrom rack, and a peter piper pizza. Do you know if the old club disney is now a peter piper pizza? That'd be really interesting if both Arizona locations turned into other indoor play places!